So I see that we have so much talk about lore and how we want more if it, but nowhere storing our existing knowledge on the Warframe universe. How can we know more about the game if we don't collect and store the data? Well, we can start by posting here. Any data you come across in-game whether it be from Lotus, enemies, or the environment themselves that confirms any kind of lore, put it here. Whatever faction you find information on should be put here. Preferably, list who or what gave you the information (ie Lotus or the name of a boss). 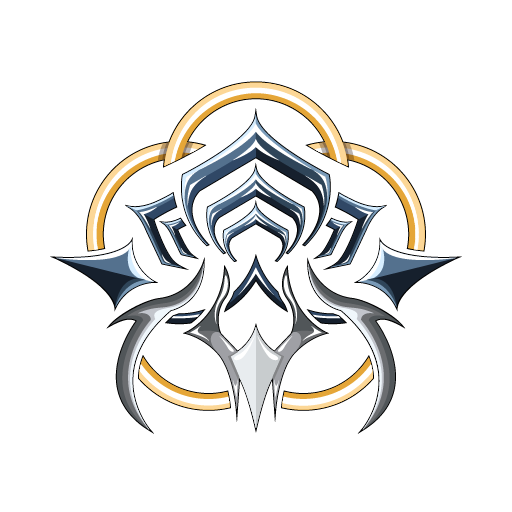 Tenno have, in the past, been forced to cleanse their allies afflicted by infestation. For this task, they employ sharp weaponry such as the Ether swords. 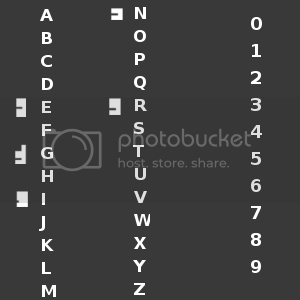 The Grineer use an alphabet based around rectangular figures of varying sizes, each with certain "notches" on the left side to further differentiate them. These characters are often found painted haphazardly on the walls of Grineer asteroid bases and equipment. 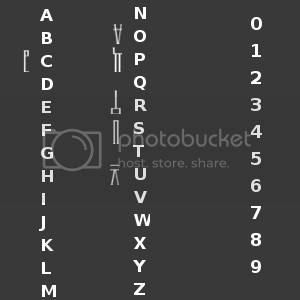 This symbol appears everywhere in Grineer writing, generally preceding the words or phrases. It appears to have something similar to a Grineer character being enveloped by a larger, angled shape. Its significance is unknown, though it is most likely the Grineer 'Logo' or political symbol; its common occurrence within Grineer military bases shows that they are very patriotic or authoritarian in displaying the symbol for obedience and loyalty. The Corpus language resembles the ancient earth "roman numerals" number system, as well as ancient Greek symbols. Bronze plaques adorn the hallways and are atop doors throughout Corpus ships, and they are used as the primary platform in order to display the written language. I will edit as more information comes in. Any suggestions or corrections just post here as well. Hopefully this is a good start! Good thread, thumbs up. Heres some little tidbits I've picked up while playing. 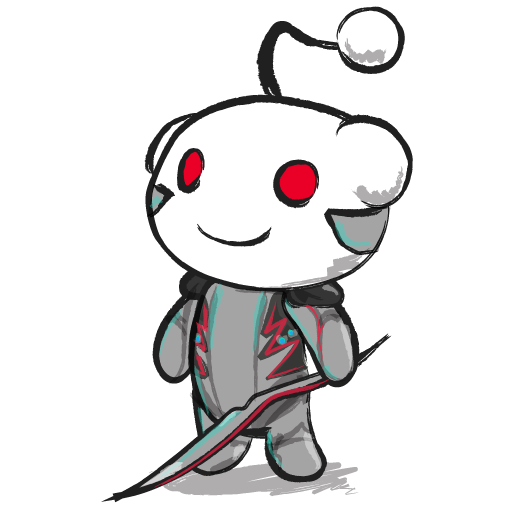 so does this mean we can have rouge/evil tenno? Updated, thanks for the information. I kept the bit about the ruling sisters sparse until we have more information. I'll have to go check out the boss for myself to get a better context. You forgot at least one snippet about the corpus. The corpus utilise mind scrubbing as evidenced by a number of system lore. Another lore snipper - the solar rail at pluto was destroyed in an old war and still has not been repaired. In the eris discription it's Orkin Derelicts not artifacts. Also it appears that the Lotus and/or the Tenno base is out side the solar system. This is based on what the Lotus said the tutorials. I'll post any other lore related findings that pop up in the text. The weirdest thing i've heard is when fighting the Golem, i need to go back.... or one of you, and listen to it again because it changes the perception of the story totally. There it says that the Golem was created by the Orokin to fight the Combine? The Intelligence? I forgot the word used. Basically..... the Infested were weapons. And the Tenno might have been their handlers, throwing out a theory. Can you find a specific source where it mentions mind scrubbing? I already have indoctrination temples but no specifics. Solar rail at Pluto is filed under the Corpus lore. Fixed, and can you provide a direct quote? It would help to determine the answer if we could all see specifically what Lotus says, to better interpret it. Someone should go back and get a direct quote, as wording would be key here. We know the Orokin developed the plague, or at least it is implied, but we do not know the enemy it was used on nor the conflict's details. The Tenno may or may not be related. I have a bit of conjecture to add. I can't say it's actual lore but I do believe it might link the universe of two different games. And it's called the Technocyte virus. The protaginist of the game is infected early on by the virus, but has congenital analgia, a condition that renders him immune to pain and thus allows him to keep his sanity while being transformed by the virus. His name? How can that be anything BUT our old friends, the Greenier? There is a lot of dialogue linking Dark Sector to Warframe and I would like to use the other game's lore to fill in gaps, but until developers confirm they are in a direct time line/universe of one another, it isn't a Warframe lore piece. Still its cool to see. I strongly believe it is, I just checked and both Dark Sector and Warframe were made by Digital Extremes. Still, until the developers say otherwise, we'll just have to wait and hope. Oh, I do hope I'm right, I really enjoyed Dark Sector! Lex is also modeled after the pistol he uses throughout the game. Nyx looks like the other armored enemy that initially infects Hayden. That enemy turns out to be femaie. There is a four legged walker tank in the game called the a Jackal. There is a camo/cloaking ability in the game that has a similar visual to Loki's Invisibility. 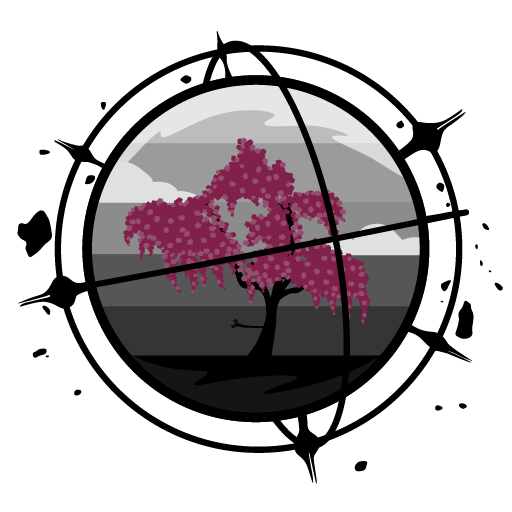 The logo of the game is a lotus flower, that happens to be the same logo seen in the loadnig screen and used by Lotus. Yes, there's a lot of similar stuff. It doesn't specificly mention that they are from out side the solar system but it seems like that is the implication. Edit: I'll be going around taking pictures of all of these that have some lore based implication. I think she is talking about the Solar Rail system. It would contradict the fact that Tenno are housed in cryopods within Orokin ruins, which are scattered throughout the solar system. It could be taken as more literal that since Mercury is where the Tenno are awakened from, it is logically their only way into the rest of the solar system. By return she could easily be meaning return by awakening rather than directly returning ot the solar system from an outside place. Other lore pieces or thoughts? doing the golem boss mission (forgot what its called) Lotus will mention the Orokin created the plague as a way to battle the "sentients" in the "achient war"
Slightly changed the wording, still very vague with what we know. Basically, we resorted to biological warfare and created a plague to deal with our enemies. So much for "known for their discipline and adhering to a code of honor. Chivalry was a cornerstone of society"
Ah, but from the wording Tenno only descend from the Orokin era civilizations, they are not the same. We share blood and some of the culture, but not the actions. At least, as far as we know. There was the Orokin era, then the "Tenno" era where they were a normal civilization and encountered the Grineer, then they went to sleep, and now we are awake again. That is my understanding. Here is the actual quote, i made a recording of it. To me it sounds more like she is saying the "Sentius." Another bit of info is that he is in a millennia old Orikin ship. So this game takes place at least several thousands of years in the future. The Grineers have "mothers", which would mean that even if they are dna-perfected, they probably are created as young, rather than being old from the start. Mother can refer to anything, but since it becomes personal when it is talked about, it is probably a person that the grineer itself values, that they probably have a deep bond to. Some that cared for them. Nothing is certain, but they do have "mothers". Is it random Grineer that say this or is there a boss that specifically mentions it, to give it a source. As I listened to it I clearly heard an emphasis on the 'Sentients', regardless the term sentient or Sentius is very broad and can mean any kind of species with a higher thinking process, free will etc..
General lore with the millennia old factoid from the Golem. Added the mother figure to Grineer Lore. I have noticed some things about the lore of the game. A lot of this is speculation and observation. From the dialogue of lotus where the player completes a mission she says, "The lotus will be pleased," (or something to that extent) implies that the lotus are an orginization rather than her name; or she just could refer to herself within the 3rd person. Also during the Vay Hek assassination she will say that killing him may, "gain us favor with the council." This implies that the Grineer (or some councillors) may be reasoned with in order to stop the war. There should also be a section covering technology although some parts may get confusing when considering the aesthetics. I would be willing to add a Technology section, but there isn't any documented information in Warframe that gives lore background on any of it. The technology is mentioned but anything about its uses or origins is speculation by the players. If we can get more information on Lotus in future updates I might have to make a section dedicated to her, and the supposed organization she belongs to. Updated with Grineer Council politics. Updated General Lore with surmised facts on The Lotus organization.